At the moment, I have the notion that I've had black thread in my machines for a while. It's not even true, I just made one black dress and that cardigan for E. Said black dress, by the way, is finished but I only managed to do that yesterday which was such a rainy, grey and dark day that I couldn't take pictures... I guess I'll have to postpone a 'reveal' until next weekend. But now, I'm looking at some colour. There are three options which have been on my mind for while. I have the fabrics and the pattern for one. The other two patterns would be quick and easy to draft because I already have most of there bodices complete (from earlier projects). I photographed the fabrics together hoping that would force the camera to display the colours accurately and it sort of worked. The raspberry pink is just not quite a dark in real life, the other two are about right. The fine wale corduroy in burnt orange was bought with this image in mind. This picture comes from Beatrijs magazine from 1951 (it may have been the illustration of a mailorder pattern but I'm not sure). According to the description, the dress was made from corduroy. 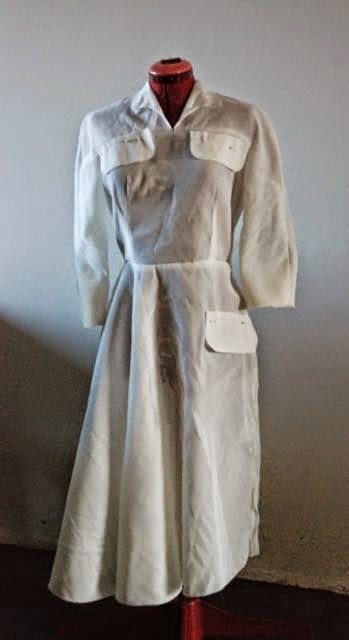 It's a shirtwaist with a straight skirt which gets plenty of room for movement thanks to deep pleats at either side of the button closure at center front. Oh, and it has great pockets. The middle fabric is a cotton flannel with a small blue and grey houndstooth check. This wasn't bought with a specific project in mind but I thought of it when I came across this image, from Libelle magazine from 1949. This picture came from an article about the new fashion and I believe the original design is French. 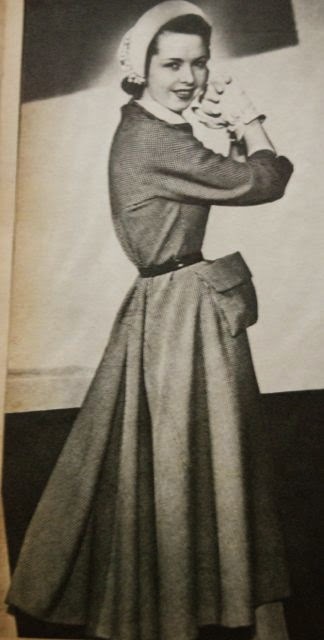 In this picture, you can see back sleeves which are cut in one piece with the back yoke, pockets which seem to hang free from the waistline, a slightly blouse-y back and a skirt which is clearly fuller at the front than at the back. ... and there is this Bella pattern which also has a lot of those features (although the back is pleated rather than gathered). It has a rather boring straight, buttoned-up front though. 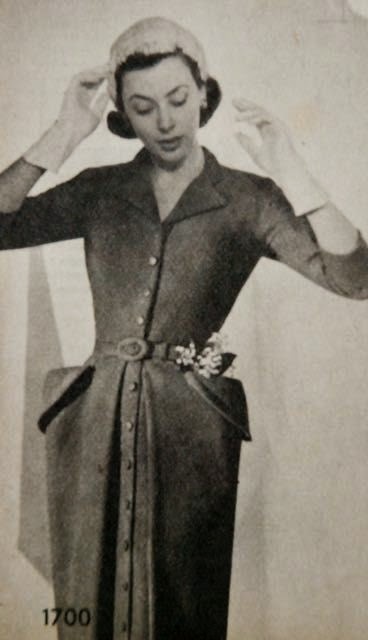 And then I found this image, in Beatrijs from 1951... Could it be the front of the same dress? Even though the first picture was from the end of the year and this one from the beginning, I think the gap is just too big and the details aren't quite right. But certainly looks like a very similar design. Then, last but not least, the fabric on the right is wool crepe. 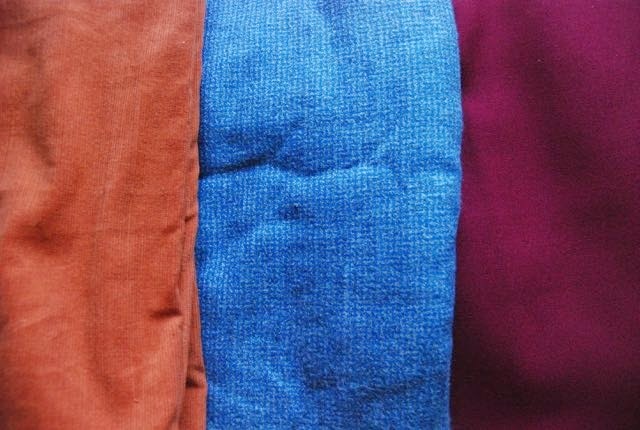 Deliciously coloured wool crepe. Unlike the other two, there's not a lot of it. I think it's 2 meters, with one bit of damage at center front. Not too long ago, I realized that this fabric would be great for one of the lovely 1920's designs I picked out as part of last year's Vintage Sewing Pattern Pledge. 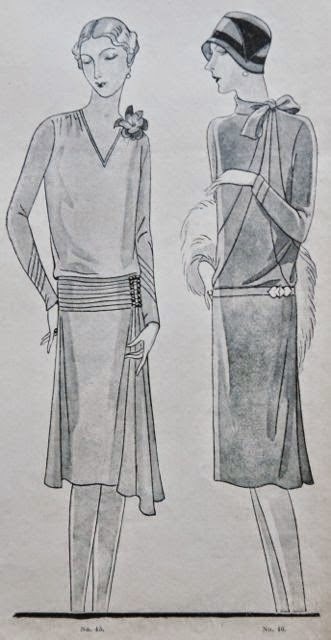 It's about the dress on the left, a daydress for winter, from about 1927. I am working on something else at the moment but soon I'll have to choose between these three beauties... What do you think? All your plans sound lovely... I would go for the wool crepe first, that way you'll have the longest wear out of it this season - the others being cotton you'll probably be able to wear then later into spring. Loving your plans already. I'm quite in love with the fabric colors! On the 'pants for bikes' thing: I never wear pants and I drive my bike daily. I never had any problems :-) Sometimes, with maxi skirts or big circle skirts I use a clothespin to pin the front and back together in between my legs so I don't show off everything with sudden wind attacks. Can't wait to see your finished makes! Mmmm, all lovely. I am voting for the raspberry wool crepe first. Your dresses and designs are 'inspired' by vintage, but they are your own. I think you should be designing patterns, whether for your own business or for a pattern company. I think there would be a market for what you do. I would buy some of them. That's a job, isn't it?